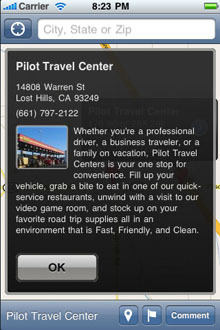 Easily find truck stops, travel centers and rest areas throughout the United States and Canada. 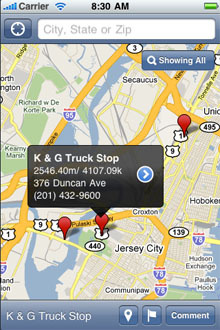 iTrucksStops for the iPhone and iPod Touch helps you quickly find a truck stop, rest area, travel center or travel plaza on your route anywhere in the North America. Find quality service at an affordable price at any of the more then 8,000 locations. 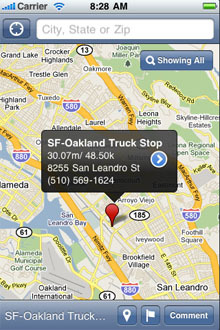 If you are a trucker or just traveling across the country then this app is for you. Discover the quickest trucks stop off major Interstates to local roads. 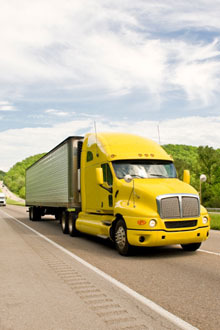 Get detailed information on each truck stops from the facilities on site to gas prices an more. iTrucksStops help you on your long hauls or travels by giving you a list of truck stops that will give you the type of hospitality and apprecitation you deserve. If you ever need a stop along the way, come by any of the quality listed locations. These places will provide you with quality service that will make you feel right at home. All truck drivers are welcome to stop and take care of any needs they may have. From the major trucks stops to the independent ones we have more then 5,000 trucks stops and travel centers listed. Note: This version is not iPad compatible. Please download the HD version if you plan on using this on your iPad. Email support@ombrosbrands.com to give feedback or report issue.